One day, without warning, Jasmyn's husband died of an aneurysm. Since then, everything has been different. Wrapped up in her grief, Jasmyn is trapped in a world without colour, without flavour - without Liam. But even through the haze of misery she begins to notice strange events. Even with Liam gone, things are not as they should be, and eventually Jasmyn begins to explore the mysteries that have sprung up after her husband's death ...and follow their trail back into the events of his life. 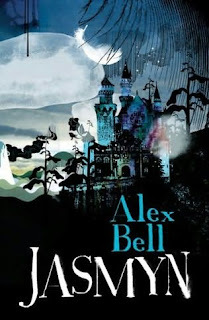 But the mysteries are deeper than Jasmyn expects, and are leading her in unexpected directions - into fairytales filled with swans, castles and bones; into a tale of a murder committed by a lake and a vicious battle between brothers; into a story of a lost past, and a stolen love. She's entering a magical story. Jasmyn's story. First off, the cover is gorgeous. Second, after checking out Alex Bell’s website, I just know that her prose will be entertaining and dark and fabulous. And third, she does twisted fairy tales, which are my own favorite little niche category. This equals amazing. In celebration of these facts I’m giving away one (1) copy of Jasmyn. Please include your email address. Giveaway is open internationally. Comments will close on September 25 at 11:59pm EST, and I will notify the randomly selected winner via email. Well the heroine that I don't like its Alice from Alice's Adventures in Wonderland.. I don't not why but I can't stand her. Oh, this cover is awesome! Okay, my least favorite Heroine would have to be Catwoman! Least favorite heroine is Goldilocks, the little thief. What a cool giveaway, I am excited to be entering! My least favorite fairy tale characters are Hensel and Gretel, simply because I find the story violent, sadistic and not at all for kids! My least favourite would be Rapunzel. Looks like you have a spammer up there. My least favorite heroine would have to be little red riding hood. Least favorite fairy tale is Sleeping Beauty. The girl just sleeps, BORING. Then, of course, she needs a male to save her, she can't just save herself. It makes my inner-feminist blood boil. LOL. Great question, though!! My least favorite would have to be Jack. He never should have traded the cow for magic beans, climbed the bean pole, or stole from the giant. He was such a selfish little boy! Yeah, I'm not a big fan of goldilocks either! Hmm, I don't if it counts as a fairy tale or a heroine, but my least favorite heroine is Clytemnestra from The Orestes. Hmm. I don't think I was too fond of Aurora. Juju - yes, it's open worldwide (and that includes the USA). My least favorite is Snow White -- and why "7" dwarfs? Celi.a: I linked you to a meme, should you choose to play along. From classic fairy tales my least favorite is Golilocks, like some other people already posted. I love the story, but are we supposed to like Goldilocks? I agreee with Andrea. She was a little theif! I have kids, and therefore I have to watch every Disney movie ever made. Of the Disney reworkings, I can't STAND Ariel from The Little Mermaid. What a whiny spoiled brat! "I wanna go where the people are....where fathers don't reprimand their daughters..." Seriously?!? Haha...sorry went off in my own little mini rant there! This book looks fantastic. I'd love to be entered. This book does look really cool! I don't know if you would consider her a heroine, but the one I couldn't stand was the little girl with the pea in her mattress. All the things she added to that bed over a stupid pea... come on! I don't quite like Alice in Wonderland. I read the abridged version and thought that the tale was kinda pointless. Can I name two? I always found Snow White in the Disney movie to be totally obnoxious and Alice from Alice in Wonderland was right there with Snow White. Thanks for the giveaway. This looks great. I'm not a big fan of Snow White. As another commenter pointed out, she didn't really have a lot of common sense (and her voice is really annoying in the disney movie). My least favorite is Pinocchio because he is just so annoying haha. I would have to pick Jack from "Jack & the Beanstalk" because he was a thief & murderer. However, seems like most fairy tales have some very nasty sorts in them. The good & evil are very pronounced to get the point of the story across. However, I've loved fairy tales since I was a wee girl! Does that make me a bit twisted...maybe, but I don't think so. My least favorite is probably Sleeping Beauty. This books looks good, though. Thanks for entering me. My least favorite is Snow White. Maybe is has something to do with a all those little men she has to wait on, ug. Great giveaway! I've been wanting to read this one for awhile now. Please enter me. My lease favourite hero/heroine is Goldilocks from Goldilocks and the Three Bears. You know, I have never been a fan of anthropomorphized animals, so I'll go with Aesop's fables. I think my least fav is Snow White. I don't know why. Thanks for the giveaway. Second, I love twisted fairy tales too! My least favourite heroinje is Cinderella - she seems a bit of a drip. Least favourite Hero is Prince Charming........ahhh that character frustrates me to no end! Great contest! My least favorite is probably Snow White. The tale is okay, but her as a heroine is really blah. She really doesn't do anything. I have to agree that Snow White is my least favorite heroine. I can't even stand watching the Disney movie. Also, I had to laugh at some of the above answers. They were hilarious! I love fairy tales, Disney movies and I like almost all the characters. They're just too difficult to hate! A twisted fairy tale like Jasmyn would be an eye-opener for me. My least favorite would be Goldilocks too. I just can't find anything to like about her. LOL. Prince Charming is a bit of a womanizer, so I'm going to go with him for my least favourite. Who is your least favorite fairy tale hero/heroine? I have to go with Peter Pan. The kid irritated me more often than not. Least favorite??? Thimblelina. I hated that one! By the way i agree.. cover looks awesomee..
My least favorite heroine i Sleeping Beauty...because she's asleep for the majority of the fairy tale. my least favourite heroine would have to be sleeping beauty. not much of a character! My least favorite fairy tale heroine is Rapunzel. Snow White... (or one of many other passive princesses) she really doesn't DO anything but keep house and get into trouble (at least in the Disney movie.) She's not very smart either.